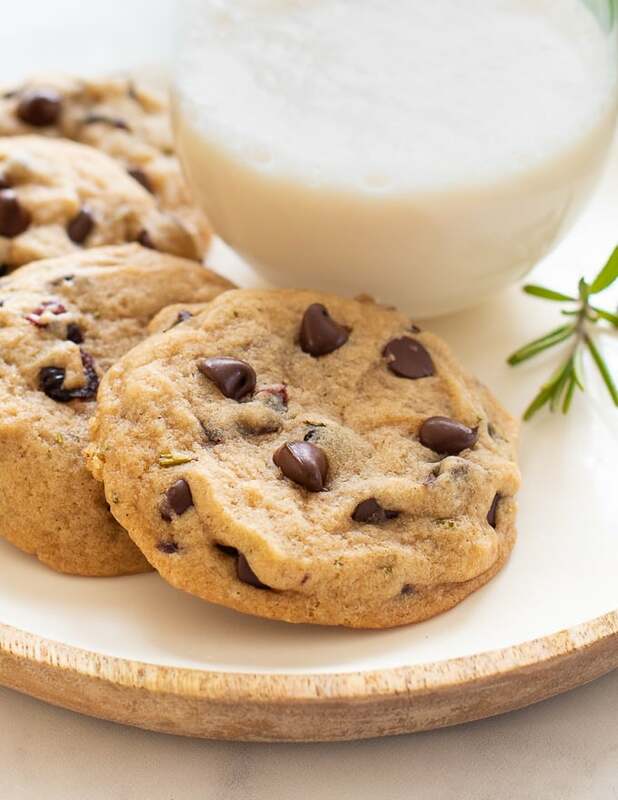 Vegan Chocolate Chip Cookies made festive with the addition of dried cranberries and rosemary! Soft, sweet, chewy, with a lovely subtle woodsy, herbal fragrance. Santa will thank you if you leave him a few of these with his glass of plant milk on Christmas Eve! 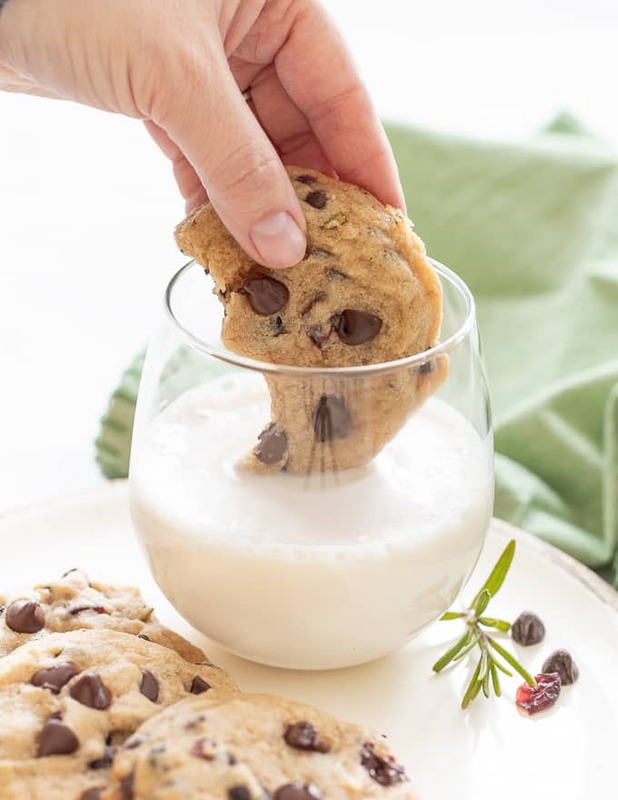 With the holidays coming up, I thought it might be nice to create a festive Vegan Chocolate Chip Cookie for the kiddos to leave out for Santa with his glass of Oat Milk on Christmas Eve. Or for the adults to hide from the kiddos then stuff their faces once bedtime comes around. ???? Truth be told, there’s not much that can beat freshly baked cookies and it’s been a long time since I posted cookies on the blog. Welcome back my cookie friends. These vegan cookies took ages to get right and it feels like I tested them about a trillion times. Keeping up with Chester who had a nasty allergic reaction to something and is taking lots of pills and is on an elimination diet – have more cookies but wash hands after so as not to contaminate him. Poor guy. 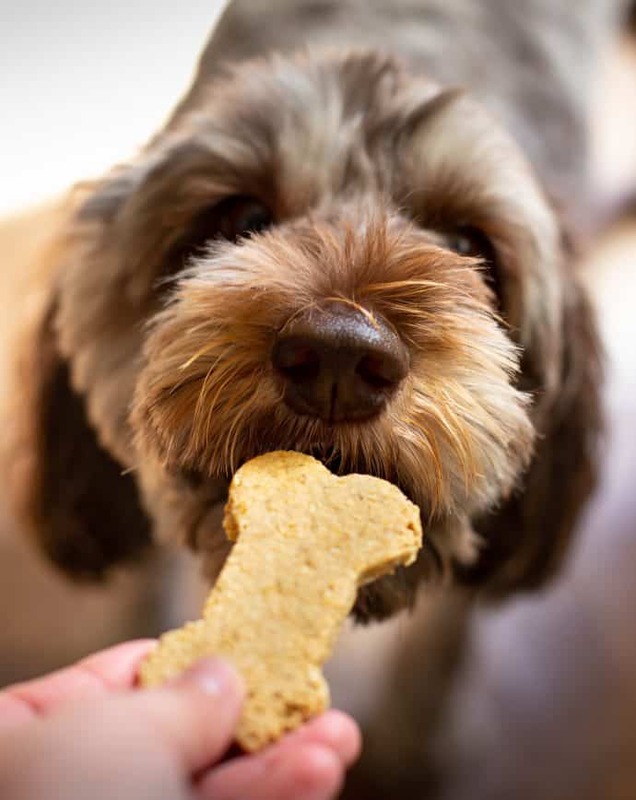 Little did he know this would be his last cookie for a long while. And poor me because I’m having to play bad cop and live with the constant puppy eyes. So, basically, all I have done for a week is eat cookies. I am ashamed to say that on one day, all I ate was cookies ???? But we are talking soft, thick, chewy, fruity, fragrant, cookie perfection and I was taking one many for the team. It’s my job to get them perfect which means eating them all to make absolutely sure.???? 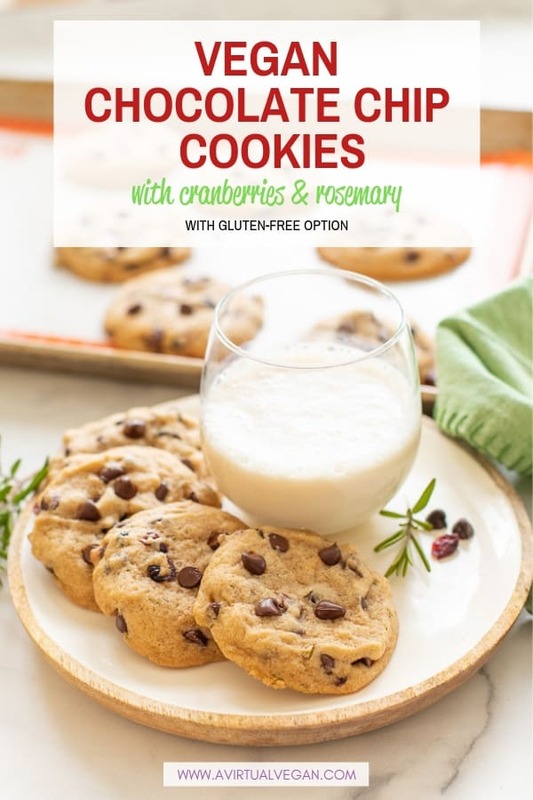 These Vegan Chocolate Chip Cookies with Cranberries and Rosemary are really easy to make and you need no special equipment. No mixers, food processors or blenders. Just a bowl, a whisk and a spoon or spatula. The longer one is great for scraping out my blender. I do also have another favourite spatula from Sur La Table with little dogs all over it which you might spot ???? Add the sugar, oil, vanilla, milk and salt to a bowl then whisk them together well. Add all of the other ingredients and mix to combine. Refrigerate in the bowl while the oven preheats, then scoop the cookie dough out onto a cookie sheet. Bake then allow to cool on the tray for 10 minutes before transferring to a cooling rack. Let your inner cookie monster loose! This cookie dough freezes really well. 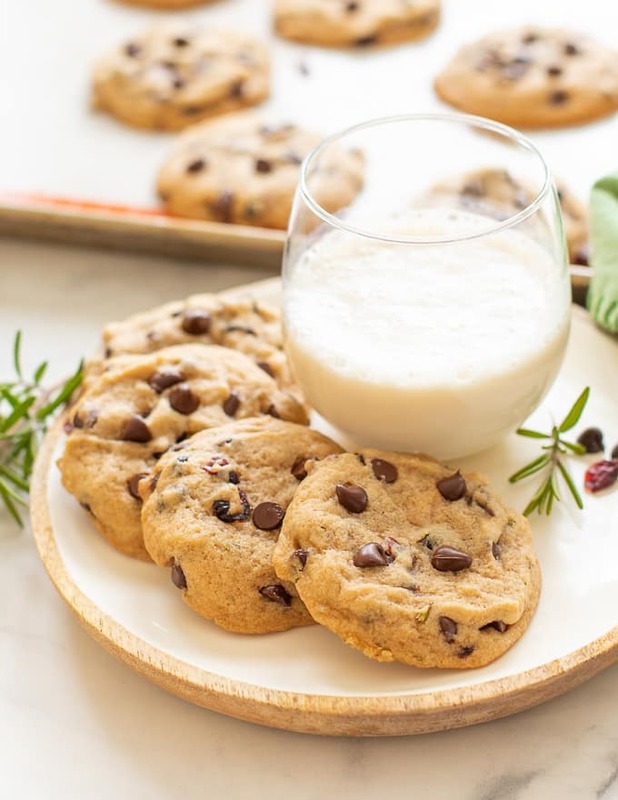 I suggest making it as directed, line a cookie sheet with parchment paper, and scoop out the cookie dough as if you were going to bake the cookies. Place the tray in the freezer for about 40 minute to an hour, until the lumps of dough are hard, then remove and place them in a freezer bag and store in the freezer until you need them. 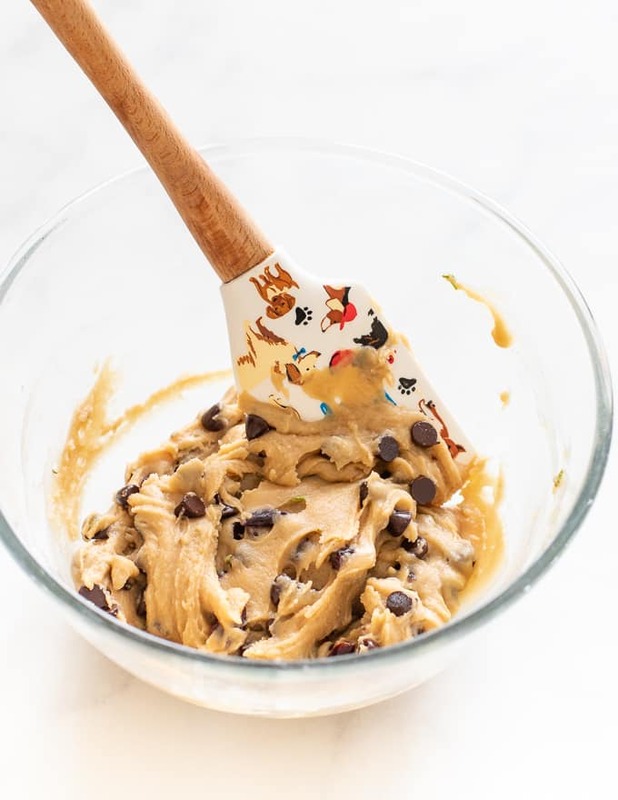 When you want to make cookies, simply remove from the freezer, place the cookie dough balls on a cookie sheet, and bake as directed, allowing an extra 2 minutes cook time. The dough will keep in the freezer for up to 3 months. Let them sustain you through the crazy holiday period! Me, I think I’m all cookie-d out. For now at least. I’ll probably change my mind by tomorrow though. 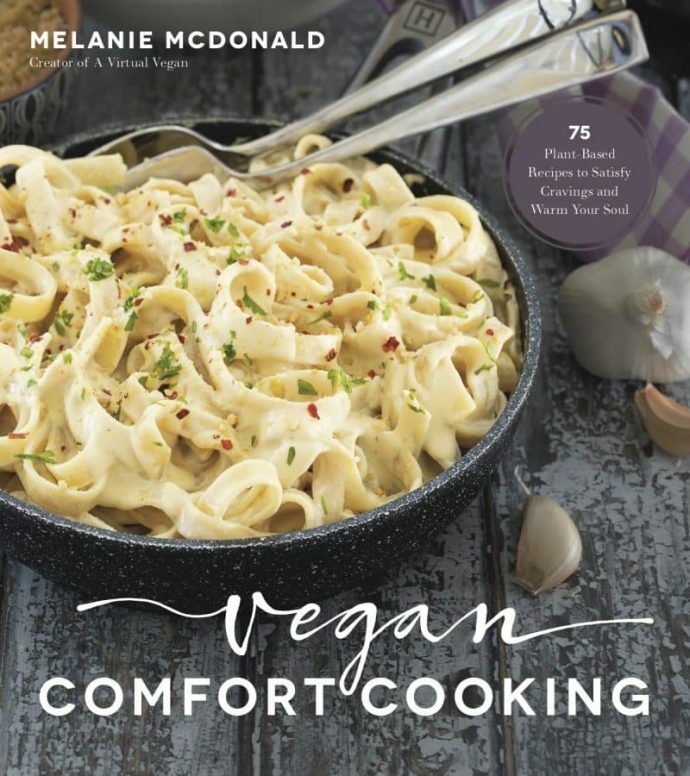 WANT HELP PLANNING YOUR VEGAN CHRISTMAS DINNER? For more Christmas inspiration, check out Vegan Christmas Dinner Menu, Shopping List and Timeline. I have planned the entire meal for you down to the tiniest detail. All you have to do, is print out my document which includes all of the recipes, a shopping list and a timeline, then get cooking! Did you know that the color of your cookie sheet can have an impact on how your cookies turn out and how long they take to bake? 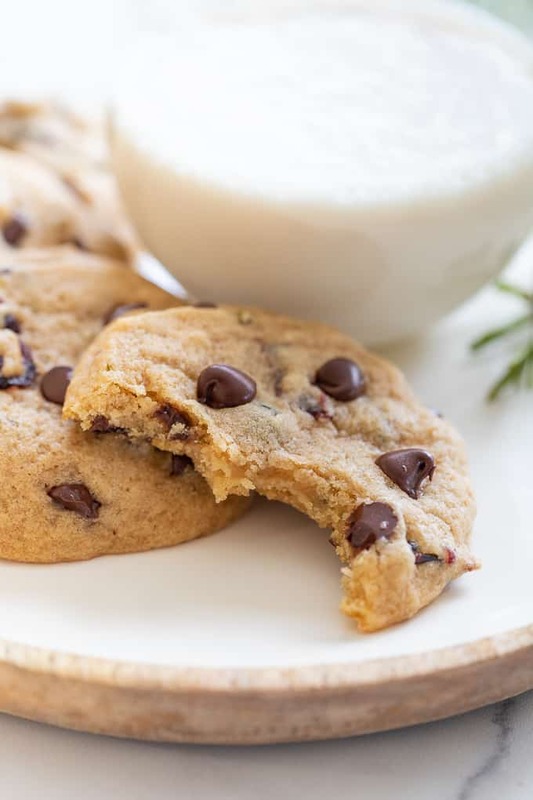 Darker cookie sheets absorb and radiate more heat than lighter ones, so if you bake your Vegan Chocolate Chip Cookies on a dark cookie sheet, your cookies will cook more quickly and have darker and crispier bottoms than cookies cooked on a lighter colored cookie sheet. so my cookies will cook slower than they would on a darker sheet and end up a little softer. If that’s how you like your cookies then use a similar color one. If you prefer them crispier then use a darker cookie sheet. I give timings for each in the full recipe below so don’t worry. With regards other foods, a useful tip to remember is that if you are cooking something that you want to get golden and crispy, like potato wedges, pizza or pastries, use a darker pan or tray. 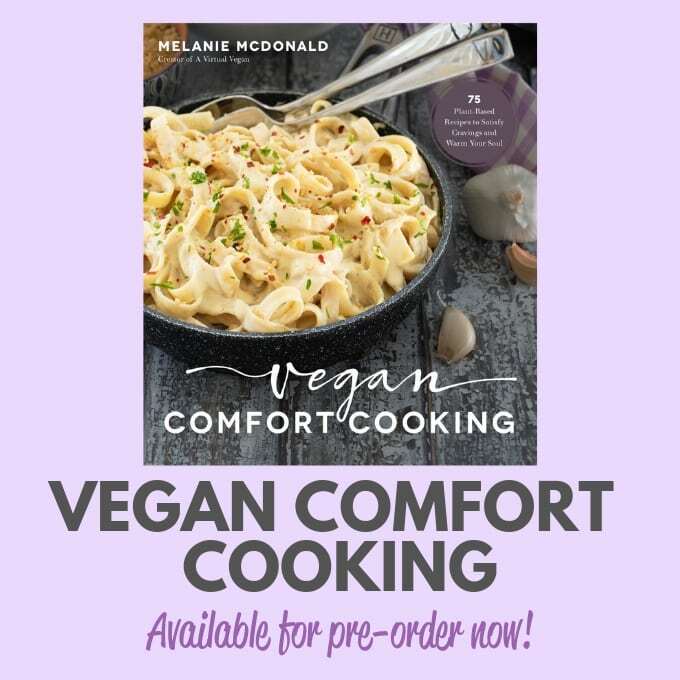 If you are cooking something that you don’t want to brown too much and that needs a slightly gentler touch of heat, like sponges, meringue, soft cookies, cupcakes or cake, use lighter coloured pans. As always with any of my recipes involving flour, I highly recommend that you weigh it. Cup measurements are not accurate enough to get the best results. If you do need to use cups, spoon the flour into the cup then level off the top with a knife without compacting it or shaking it down. By doing it like this you will get roughly the correct amount. If you scoop the flour up into the cup, you will end up with much more than is needed and it will affect the outcome of the recipe. Digital scales are available at most grocery stores now for around $10 to $15. O they are easy to purchase from online stores like Amazon. They are a great investment and are so worth having! In a medium bowl, put the brown sugar, white sugar, coconut oil, vanilla, milk, rosemary and salt. Whisk them together really well until the sugar granules have dissolved. To the same bowl, add the flour. baking powder, baking soda, chocolate chips and dried cranberries. Mix everything together well with a spatula or wooden spoon. It should be soft and easily mixable. Check the texture in my photo of the cookie dough above, or in my video. If it is dry or stiff to stir add another tablespoon or two of milk. Place the bowl of cookie dough in the fridge for 10 minutes while you preheat the oven to 350°F (175 °C). 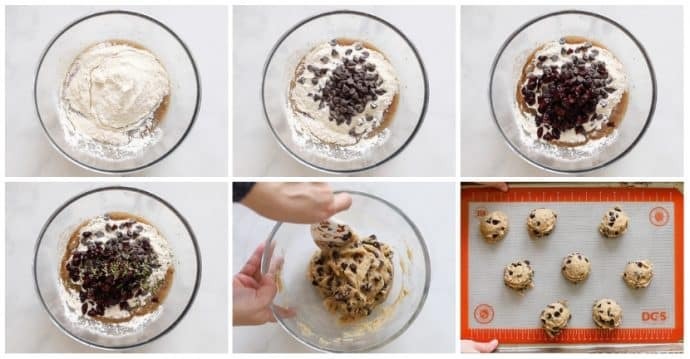 Using an ice cream scoop, scoop dollops of the cookie dough onto a cookie sheet, leaving at least 2 inches space around each one. 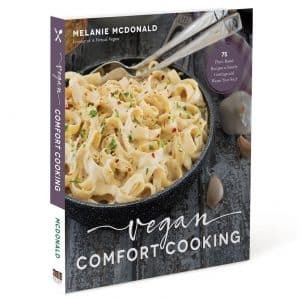 Place on the middle shelf of the oven and bake for 11 - 12 minutes if using a dark colored cookie sheet, or 13 - 14 minutes if using a light colored cookie sheet. 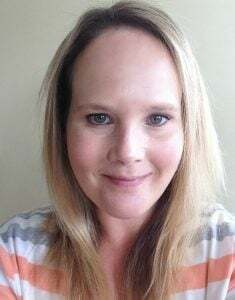 They will look a little underdone and be really soft when you take them out. Leave them to cool on the cookie sheet for 10 minutes, then place them carefully on a cooling rack. As per my note in the post above the recipe, using a digital kitchen scale is the only way to get truly accurate results when baking. 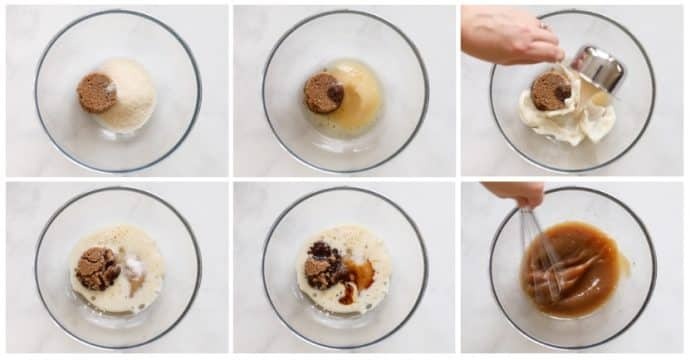 If you must use cups though, please be sure to spoon the flour gently into the cup and level the top with a knife, without shaking it down or compacting it into the cup in anyway. If you scoop your flour up or compact it you will end up using way more than is intended. Looks amazing! Would I be able to make the dough a day or two in advance and keep chilled in the refrigerator until I’m ready to bake? It should be fine, although I haven’t tried it myself so can’t say for sure. I’m sure it will be though. They turned out really good. Thank you so much. Your tips were helpful too! I just made these, actually I’m eating one as I type ??? ?, they are delicious! I didn’t have any white sugar so used light soft brown sugar and I will definitely be making them again and again and again ???? I’m so pleased you are enjoying them Yamuna, atnd hank you for stopping by to leave feedback. I really appreciate it! 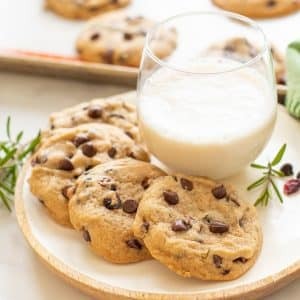 Would I be able to use a drop of Rosemary essential oil to this recipe instead of fresh rosemary? I think you could yes. Make sure it’s actually a food grade essential oil though. Some aren’t. Hi Cait. Yes I think you could add a handful or two of oats. You might need to add a little more milk though. Just make sure the dough is like the consistency in my video when you’ve finished mixing it and it will be fine!